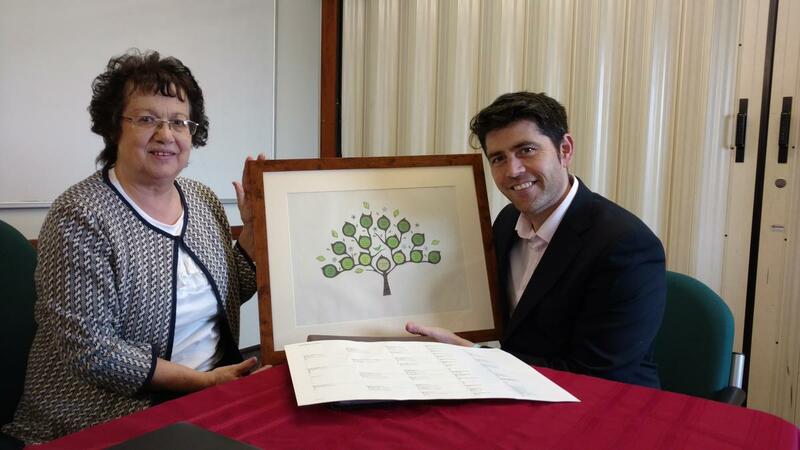 North Cornwall MP, Mr Scott Mann, attended the Family History Centre of The Church of Jesus Christ of Latter-day Saints (Mormons) in St Austell to receive a framed picture of his family history. Members of the congregation, Lucy and Jean Dean, researched Mr Mann’s family history to trace his five family generations, which he was delighted to receive. Mr Mann also toured the meeting house on Kingfisher Drive to discover more about the beliefs and practices of the Church. Due to the rural nature of Cornwall, St Austell Ward’s boundaries are one of the largest in the UK, covering half of Cornwall and containing four different parliamentary constituencies. Mr Mann was able to meet various members of the congregation including some of his own constituents who travel up to an hour each way to attend church every Sunday. Sister Jean Dean and her husband Terry are long term members of the St Austell Ward and helped to build the current chapel. As Ward Family History specialists they offer an extremely popular free of charge monthly genealogy service at St Austell Library.